Simon started his career at Leyton Orient after being plucked from the West Ham Academy. He remained at Orient between 1998 and 2004, which included a loan spell at Aldershot Town, although a knee injury affected the early part of his career. 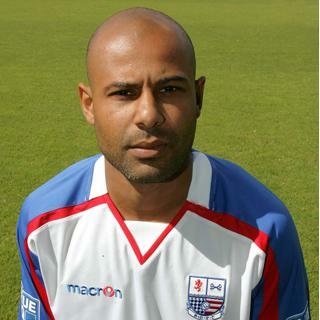 He moved to Weymouth for the 2005/2006 season before moving onto Grays Athletic from 2006 to 2008. After leaving Grays early in the 2008/2009 season, he had non-contract spells at Wivenhoe Town and Sutton United prior to moving to Nene Park on 31 December 2008. Simon made his Diamonds debut in the 1-1 draw with Stevenage Borough on New Year’s Day and after impressing during the remainder of the 2008/2009 season, he signed a one year deal with the club at the end of May 2009, with the option of an extension. After some impressive performances in defence during February 2010, he won the ‘Player of the Month’ award from the Evening Telegraph and he celebrated being presented with that award by scoring his debut goal for the club in the 8-0 victory over Gateshead on 13 March 2010. After helping the Diamonds to the end of season playoffs, he failed to agree terms for the following season, and joined Isthmian Premier side Sutton United in July 2010. He was voted Players’ “Player of the season” in the 2011/2012 season, helping them to the Conference South Play-Offs. After four years with the club, Simon left to be nearer his home, joining Conference South side Maidenhead United on 1 July 2014. He returned to Sutton in 2015 and went on to make over 250 appearances for the club before starting the 2018-19 season with Hampton & Richmond Borough.